"She was never crazy; she just didn't let her heart settle in a cage." Those who know me well would vouch for the fact that I'm quite the crazy soul. Responsibilities and practicality are most definitely an integral part of my life, but I'm almost always dancing to a tune of my own and am just high on life. Meeting someone who is cut out the same way means double the dose of fun and madness and that's exactly what I found in Nikita, my soul sister. 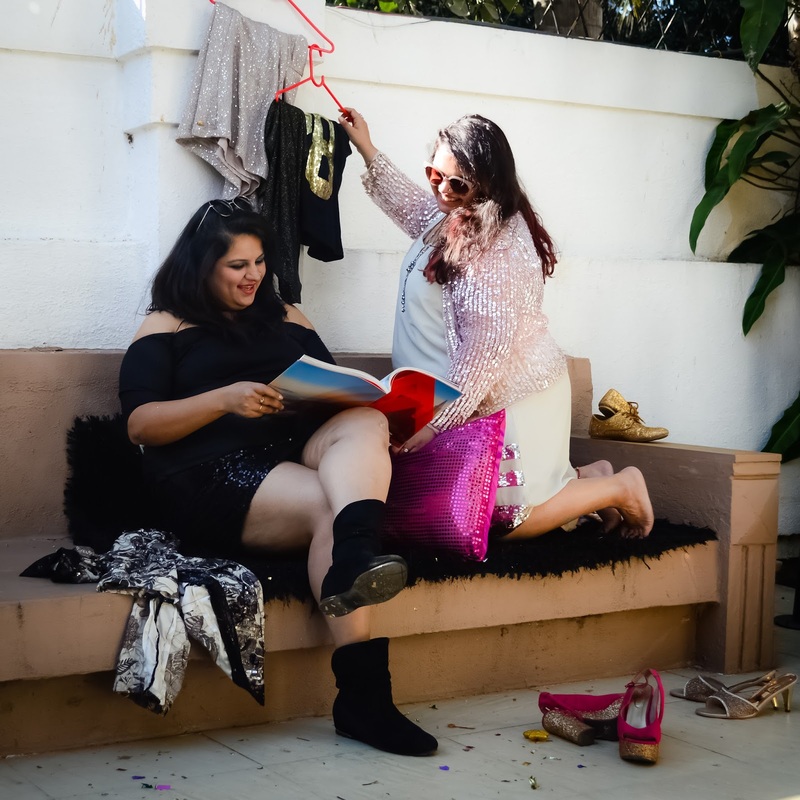 A plus-size divalicious babe, in addition to our connection on a personal level, the wardrobe twinning with her in terms of style AND size really took things up a notch and how! 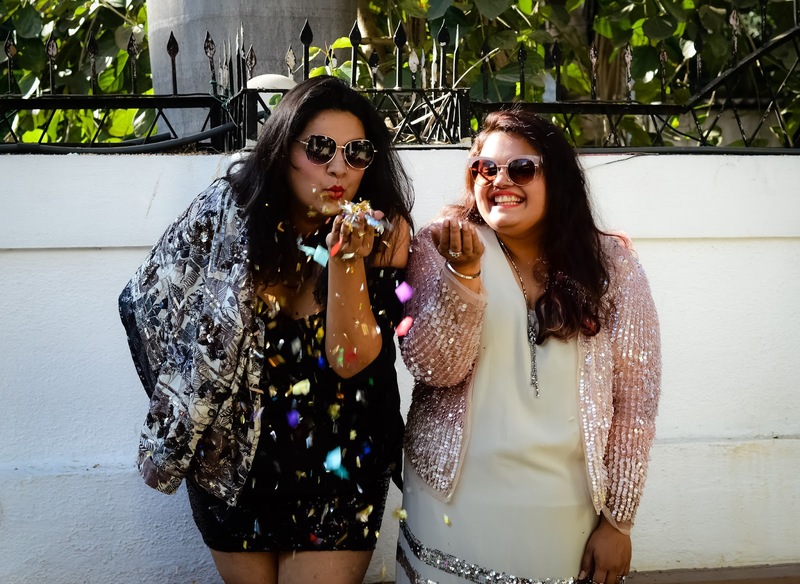 I'd been waiting for a relatable idea to do a twinning post and here it is; a post dedicated to our mutual love for all things shimmery and sequinned. Recently, Nikita and me decided to have a bling party. (Yes, in the middle of the day!) 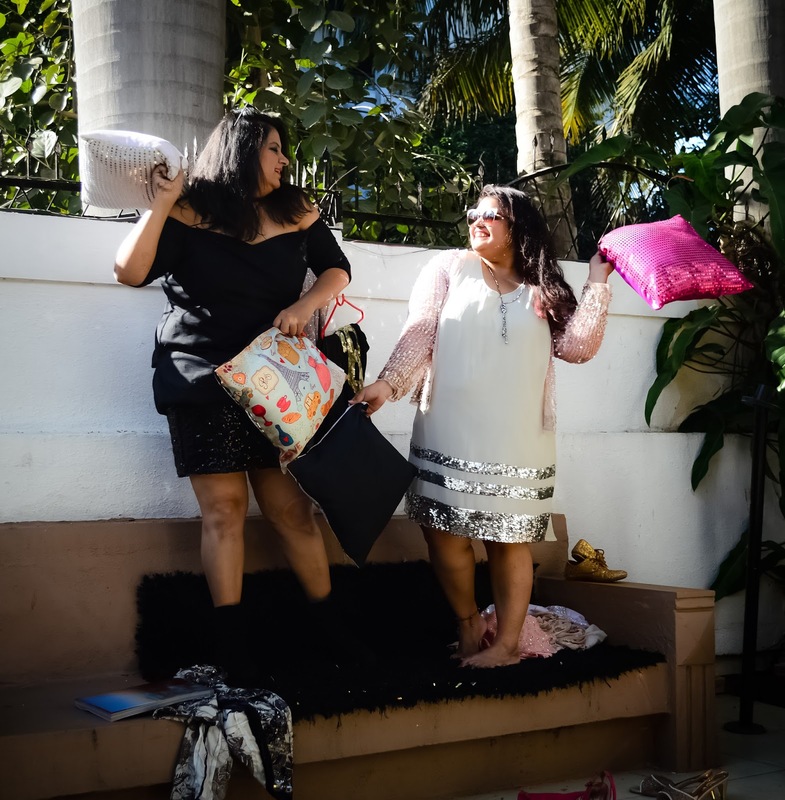 Instead of going out for a drink, we thought of doing something different and given our craziness, we had the funnest party for two at home! As you can tell from the pictures, we do own way too much sequinned stuff and share a mutual love for fashion. I'm going to deviate a bit from the post to mention just how important it is to take some time off and spend quality time with the right kind of people. Surround yourself with people who genuinely love you for who you are and wouldn't judge you for the choices you make. This mad afternoon left me feeling so grateful for having the liberty to do impromptu things. 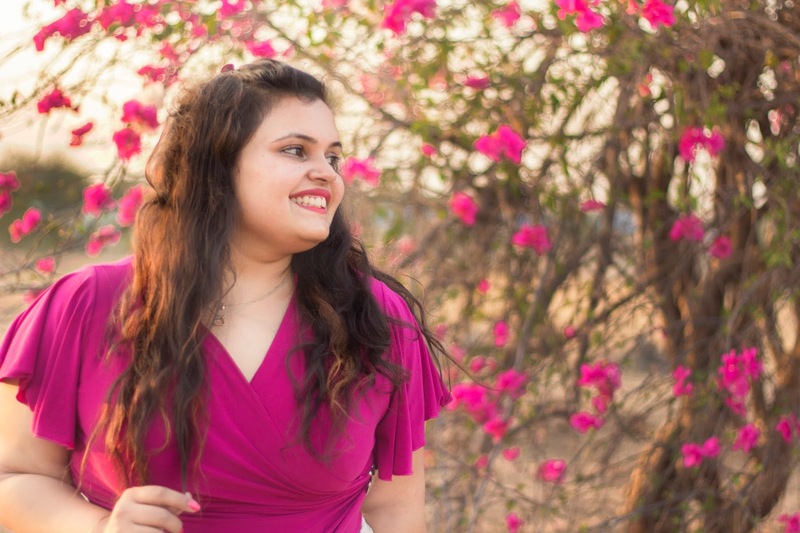 Coming to my favourite part of the afternoon, our outfits...I'm wearing a dress that Nikita got stitched with an embellished jacket that I, SURPRISE SURPRISE, picked up from Sarojini Nagar last year. 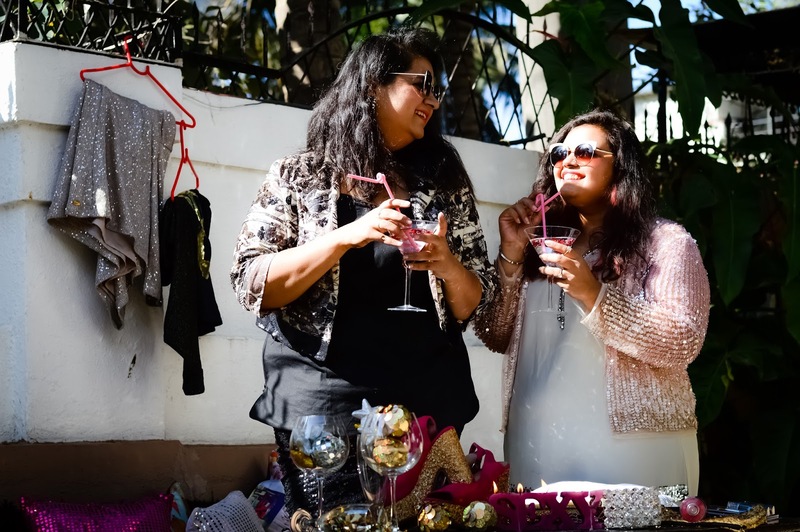 Nikita is wearing my sequinned skirt from StalkBuyLove with her tailor-made top and embellished jacket. While my outfit is more day-time appropriate, Nikita's would be our go-to look for a night out. 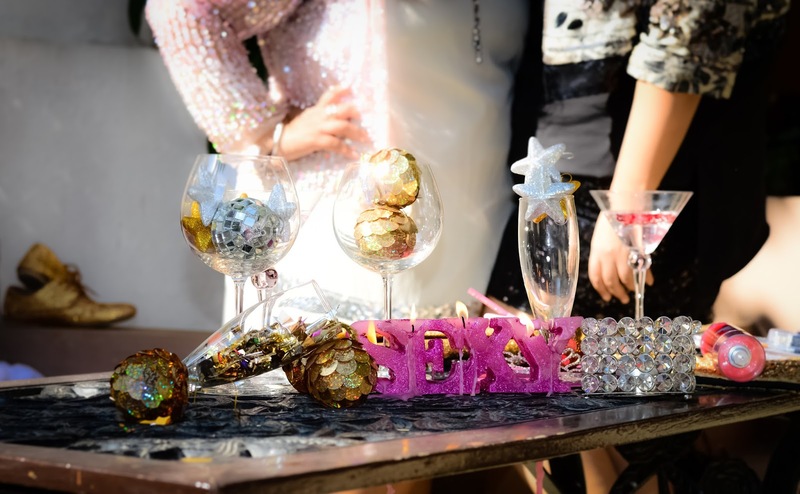 White and pink is a combination I absolutely love and a shimmer twist to it just makes the look so apt for a day-time party. On the other hand, enough can never be said about the power of black. However, to switch things up a bit, playing around with different textures in the same colour is a great idea. 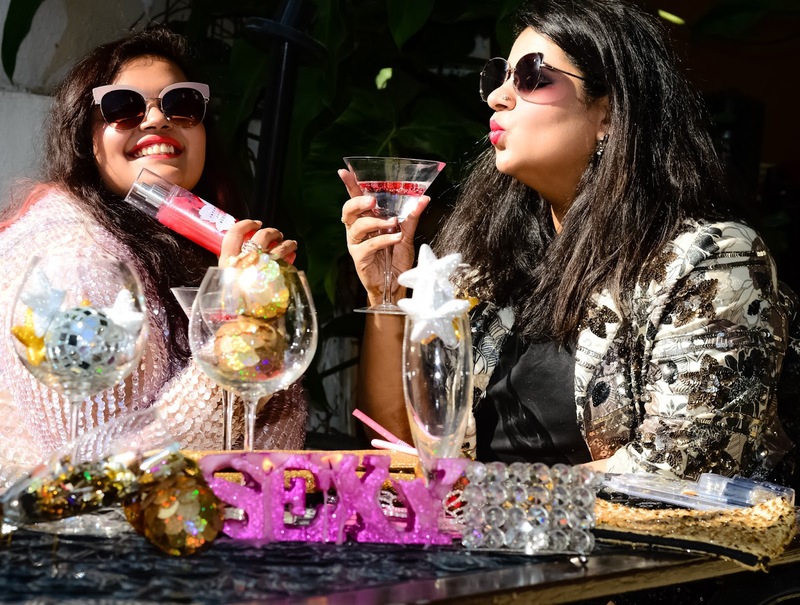 This twinning party for two will always be one of my best memories and I really hope you liked going through this super casual and candid post (very different from what I've done before). What's your idea of twinning like? How do you feel about sequins for the daytime? Let's chat in the comments section below. Lots of love - M & N!